SANDPOINT, Idaho — Bonnie Thompson never set out to look for bigfoot, but can’t help but can’t help but wonder if she stumbled onto a sign of the elusive bipedal humanoid. Thompson was fishing with friends in the Trestle Creek drainage 30 years ago this month when she glanced down at the game trail she was walking on and saw a large footprint. “As soon as I saw it, I knew it was something unusual,” said Thompson. Thompson said her companions were dubious of her assessment, but the laughing stopped once they saw the tracks. Other similar tracks were found on the forest floor, but due to the ground cover they weren’t as discernible as the other two. Thompson later went to Merwin’s, purchased plaster of Paris and returned to the creek, where she made impressions of the footprints. “They appear to be the same left foot,” said Thompson, who suspects whatever was making the tracks was walking with one foot on the game trail and one foot off. Thompson does not believe the tracks were made by a bear because there were no claw marks extending from the top of the prints. Moreover, the casts of the tracks fit neatly together when one is laid atop the other. One of the casts has three prominent, bulbous protrusions that resemble toes and another which appears to be the ball of a foot. Thompson believes the creature was striding on the balls of its feet. The casts were stowed for a time in a paper grocery sack and later in a cardboard box. Sometimes she would show them to guests if the topic of bigfoot came up. “For the most part, people are perplexed and amazed,” said Thompson. Several years later, the Spokane Chronicle published a story featuring Grover Krantz, a Washington State University professor who was regarded as a leading authority on bigfoot. 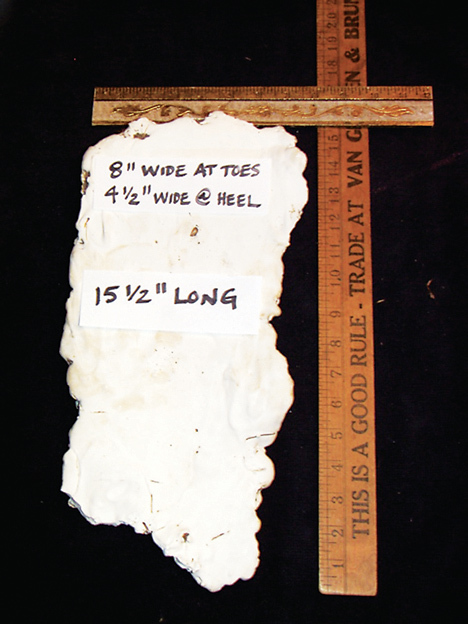 Krantz is pictured in the story holding up plaster casts of purported bigfoot tracks found in the Umatilla National Forest. Thompson was struck by the similarity of the casts, leading her to believe the same type of creature left them. She said she was compelled to reach out to Krantz, but procrastinated until 2002. But when Thompson phoned the university, she was advised that Krantz had passed away only hours before she called. “That was a big lesson in procrastination,” she said. But she said Meldrum dismissed them as overlapping elk tracks after he reviewed photos of Thompson’s casts. Thompson counters that the elk would have to do some fancy footwork to leave such tracks. Meldrum did not respond to emails requesting further comment on the Thompson casts. Thompson, however, is undeterred and is hoping some publicity might inspire others in Bonner County who may have had their own bigfoot-related encounters or finds. “It’s been 30 years. I shouldn’t go another 30 years with them sitting in a closet,” she said.